If you like to watch Doctor Who but would like more then 1 Doctor then you just need to get this Doctor Who Twice Up On A Time Christmas episode. The 2017 Christmas episode of Doctor Who included Bill Potts as the companion but there is not just one Doctor in this episode as there are the 1st original Doctor in it but also it is the last episode of the 12th Doctor. 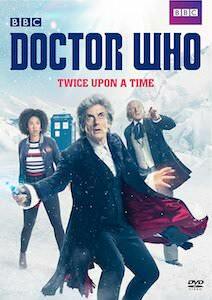 And as a true fan of Doctor Who you probably watched this Christmas episode but that probably means that you really want to own it and you are in luck as you can get this Doctor Who episode on DVD or Blu-ray. If you are enjoying series 10 from Doctor Who then you should check out this Doctor Who poster. 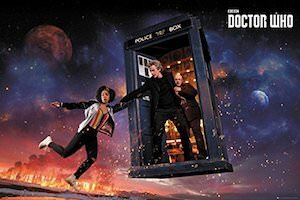 The posters galaxy in the background and the Tardis is flying in it with the doors open and you can see that the Doctor is holding Bill Potts as she seems to be dangling out of the Tardis and Nardole is behind the Doctor making sure both are safe. The Doctor Who poster is 36 x 24 inches and will be sent to you in a sturdy cardboard tube. So find the perfect spot for your new Doctor Who poster as this shows series 10 at it’s best. 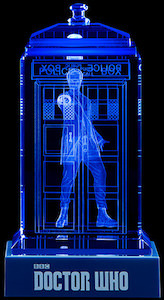 If you like the Doctor and his Tardis then this crystal figure is what you just have to see. The piece is a crystal Tardis with inside the 12th Doctor pointing at you and yes it is 3D so you can look from all sides. 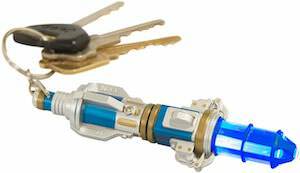 The Tardis comes on a base that has the Doctor Who logo and a LED light so that the Tardis can light up blue and becomes a cool light. The crystal Tardis on its base is 5.5 inches tall and comes in a nice presentation box making it a special gift for a true Doctor Who fan or for yourself. If you always wanted to hug Doctor Who then now you can thanks to this plush version of the 12th Doctor. 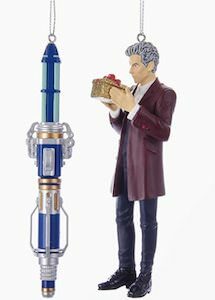 The Doctor looks spiffy in his coat and even wears nice and shiny shoes and he is holding his Sonic Screwdriver because you never know when he needs it. 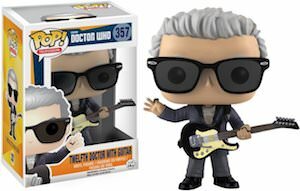 And this 9-inch tall plush is not just a plush as it also talks just like the Doctor and it is rated ages 3 and up so even grownups are allowed to play with him. 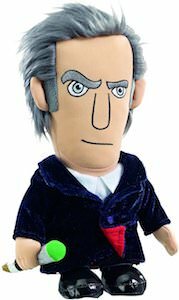 A Doctor Who plush is great because it looks fun and would look amazing in a chair, the couch and even the backseat of your car. If you are a Doctor Who fan in need of socks then you are in luck as this set of 5 pairs of socks is all about the Doctor. The set includes 5 pairs of no-show socks and that means that you are the only one that knows that the Doctor is at your feet. The Doctor Who socks show the outfits of 5 of the Doctors so that you can adjust the Doctor with the way you feel that day. There are socks from Doctor’s 4, 5, 10, 11, and 12 and all have that written on the bottom but the top looks like their famous outfits. Now you can have Doctor Who socks with the 12th Doctor on them. These socks are one size fit most and will work for both men and women that like the Doctor on their feet. And these socks are not matching so every foot shows somethings else. One foot shows the text “I Am The Doctor” while the other foot shows the 12th Doctor on them. The socks are white and have black toes and edge on top and the print is in black, white and red. So now you can have fresh socks that have the Doctor on them and a true fan wants that for sure.